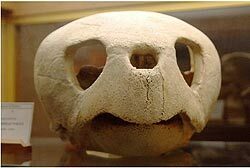 The Loggerhead turtle listed as endangered. 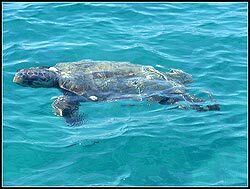 It is slightly smaller than the green turtle and has a red-brown carapace. It nests in the southern Great Barrier Reef - most commonly islands of the Swain Reefs, islands of the Capricorn-Bunker Group and the mainland around Bundaberg. The Loggerhead turtle has a comparatively large head and it uses its thick, powerful jaws to crush shellfish and crustaceans. They rarely come ashore spending most of their lives in the open ocean and in shallow coastal waters. Hatchling loggerhead turtles live in floating mats of Sargassum algae. They spend up to 85% of their day submerged, with males being more active divers than females. The average lenrth of dives is 15–30 minutes, but they can stay underwater for up to four hours. Size & Weight: Adults are typically 80-110 cm in carapace length and weigh between 70 and170 kg. Diet: Mainly carnivorous and feed mostly on shellfish that live on the bottom of the ocean. They eat sponges, corals, sea pens, polychaete worms, sea anemones, cephalopods, barnacles, brachiopods, isopods, insects, bryozoans, sea urchins, sand dollars, sea cucumbers, sea stars, fish (eggs, juveniles, and adults), horseshoe crabs, clams, mussels, sea urchins, jellyfish and other small invertebrates. The loggerhead has a greater list of known prey than any other sea turtle. Loggerhead turtles have many predators. Egg and nestling predators include oligochaete worms, beetles, fly larvae, ants, parasitoid wasp larvae, flesh flies, crabs, snakes, gulls, crows, foxes, opposums, bears, rats, armadillos, honey badgers, skunks, canids, raccoons, cats, hogs, and humans. Once the turtles reach adulthood, their large size limits predation to large marine organisms such as sharks. 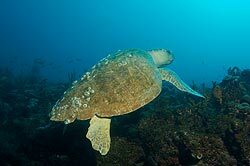 Habitat & Distribution: They are found in in coral reefs, bays and estuaries in tropical and warm temperate waters off the coast of Queensland, Northern Territory, Western Australia and New South Wales. They also live in the shallow water along the continental shelves of the Atlantic, Pacific and Indian Oceans. The 4,687 acre Botany Bay Plantation Wildlife Management Area (WMA) is located adjacent to the waters of the Atlantic Ocean in the northeast corner of Edisto Island in lower Charleston County. The beach is utilized for nesting by the federally-threatened loggerhead sea turtle.